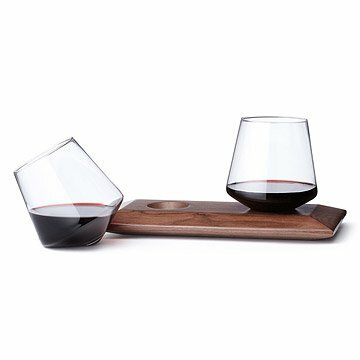 These stemless glasses twirl to aerate wine, brandy, or whisky to develop their subtle bouquets. The inspiration for this appropriately tipsy glassware was found in a small wine bar in Florence, Italy, Daniele "Danne" Semeraro's present home. After accidentally snapping the stem of a wineglass, the Swedish-born designer concluded that the glass's stem was superfluous, both from an aesthetic and a technical point of view. He set forth to design a modern glass that would behave like a traditional piece of stemware but wouldn't need to go to such heights to do so. With this set, Danne cleverly displays his true design heritage, by mixing modern, Scandinavian functionality with Italian style and elegance. Each down to earth tumbler twirls ever so slightly to aerate cupped wine, brandy, or whisky in order to develop aromas and delicate bouquets. The glasses are designed ergonomically to fit snuggly in the well of the drinker's palm, allowing each person to warm beverages ever so slightly with his or her touch. Add the wood tray to provide an exquisite, sculptural resting spot for glasses between sips. Wood tray is made in Los Angeles, California. Glasses made in China. Daniele 'Danne' Semeraro was born and raised in Sweden, in 2000 he moved to Florence, Italy. Here he completed his degree in Interior and Industrial Design at Accademia Italiana. He has honed his skills over the years working for a wide range of design firms, from automotive companies in Sweden, to interior and lighting design firms in California. His focus has always been on product design and after leading as Design Manager for one of the top lighting manufacturers he started Sempli. With Sempli, Semeraro can fully showcase his true design heritage. Mixing Sweden's simple functionality with Italy's Style and elegance. Wipe tray with damp cloth and refinish with natural wood wax. I use these glasses all the time! For any occasion, and actually for any drink! I assume my brother uses these wine glasses to drink wine. Absolutely amazing! All around great! glass is cool and tray is elegant. Comes in a fancy gift box! My friend thought this was one of the most unique gifts ever received. Unique and high quality. Very unique, well made gift. I was confused by the reviews I read saying to make sure you also ordered the wooden tray--it came with the glasses when I ordered. Wish the tray was larger but overall a stunning gift. Great gift for the wine enthusiast. These glasses were some that I had seen a decade ago and have searched for ever since. The design is unique enough but not overstated. Will definitely purchase more in the future! Lovely and unusual. I want more! I bought this set of glasses with the tray for our 5th anniversary (wood). The shape of the glasses is perfect for concentrating the aromas of the wine. The tray is beautiful and wonderful for display but the handmade nature of each glass prevents it from sitting perfectly. The holes could be slightly larger. I wish I had also ordered the coasters to set the glasses down anywhere when in use. got this as a 5th anniversary present for my husband. he loved it and we both love having a unique glass of wine together. These glasses really embody the true essence of sophisticated design. They are both seductive and functional. Love them and they were loved by the receiving wedding couple! The crystal glasses were gorgeous, unique. The wooden tray I purchased in addition did not come close to the quality of the glasses. It had what looked like a scratch and small dings on it. For the total price of the set, I felt the tray took away from the overall quality of the gift. I would still recommend as a gift, but with strong warnings about the wooden tray.